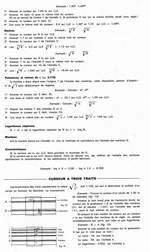 Quick Search: Hit CONTROL-F to search THIS page with your browser! 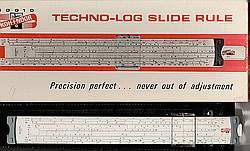 Welcome To The Sphere Research Slide Rule Site ! Visit our amazing document server. Everything from Quotes and SciFi to Business and Ethics. 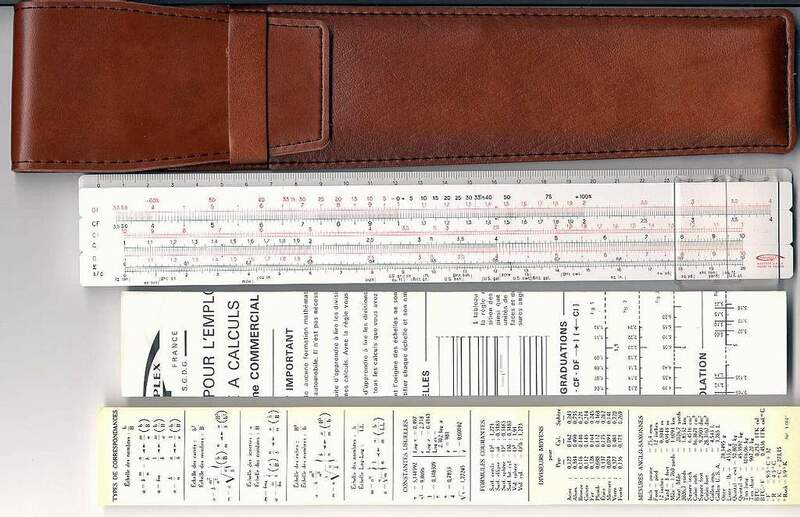 A great source for test equipment, repairs, calibrations, useful metrology information, and of course, SLIDE RULES! Skip the INTRO, Go RIGHT to the Archive! 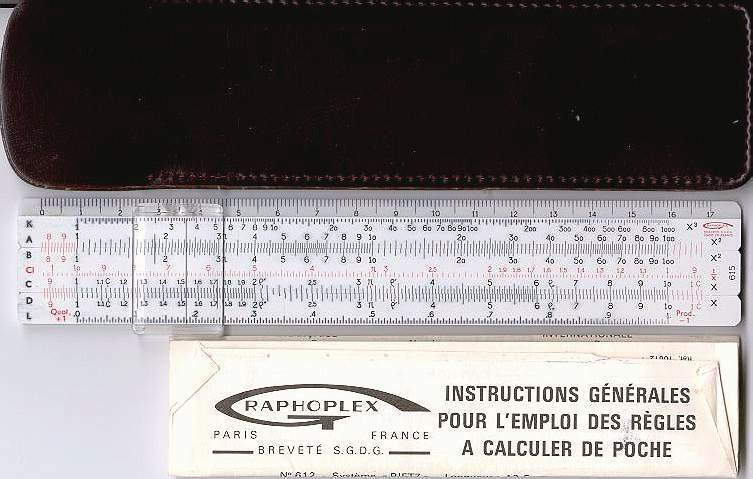 Graphoplex (often mistakenly called Raphoplex because people do not realize the large stylized surrounding G is part of the name) was the main slide rule manufacturer in France. 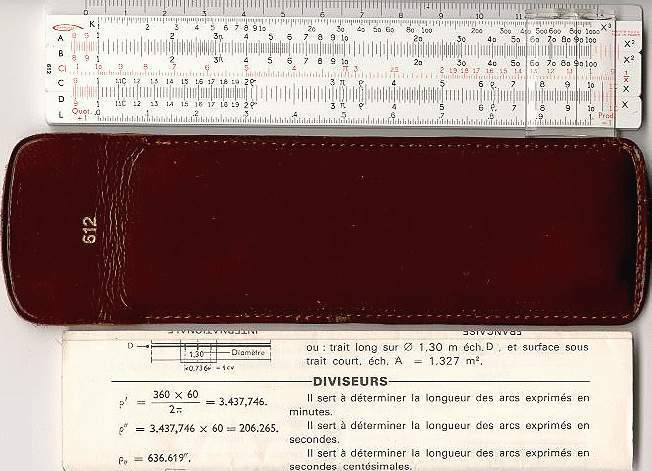 They were based in Paris, and all their rules found so far are of plastic construction, and from the materials used, would seem to be a post-WW2 manufacturer. 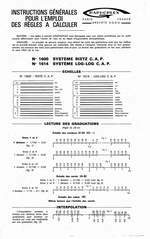 Only short form catalog additions to instructions sheets have been found so far, so the complete model range and dates of manufacture are not known at this time. 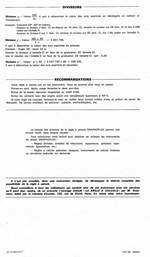 The rules are all very distinctive in style, and are exceptionally attractive and well designed. 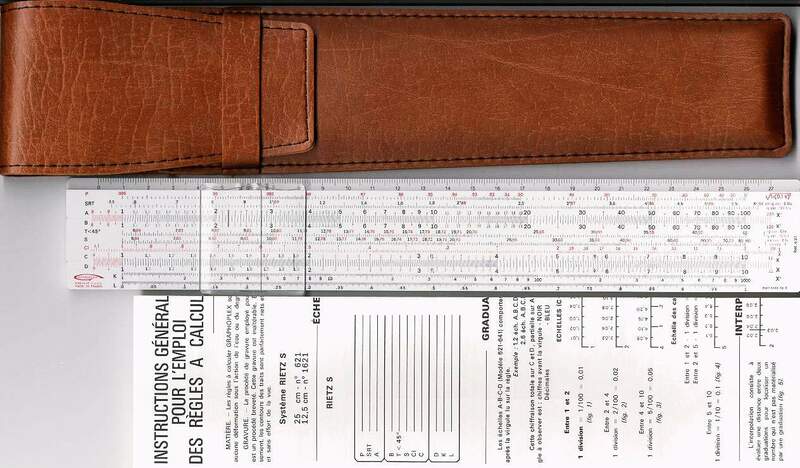 Common color schemes were maroon, violet and gray, and cases were typically a two part plastic case (maroon or later, gray), or a thin brown flap-style leather case. 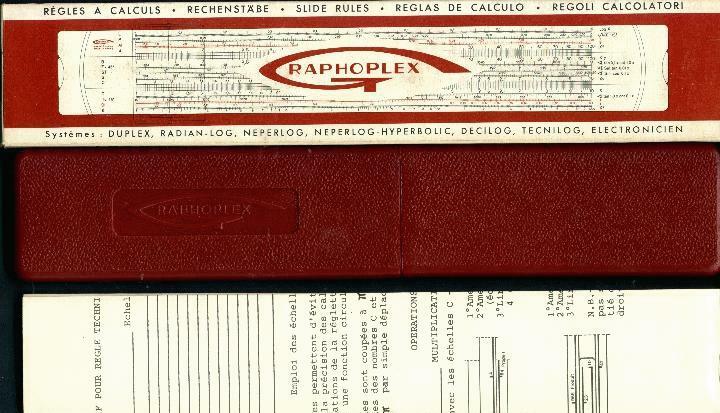 The large stylized G with 'raphoplex' inside is their logo, and often confuses people into thinking the rules are called 'Raphoplex' rules. 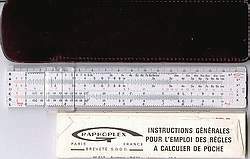 The higher end (gray end brace) duplex rules from Graphoplex were also sold in the USA by the large drafting supply distributor, Koh-I-Noor, based in New Jersey, and still have the Graphoplex logo. 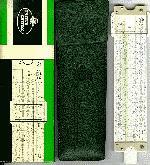 Like other slide rule makers, Graphoplex either produced general drafting items or distributed them as well. 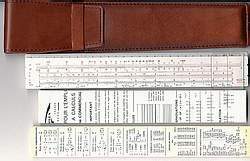 Drafting sets with the Graphoplex logo, as well as other related drafting and art items are known to exist. 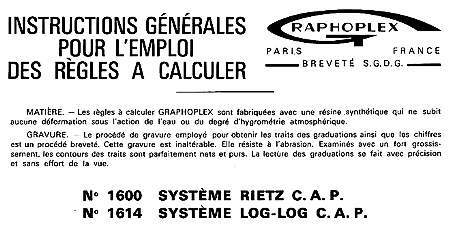 I have been unable to locate a current company called Graphoplex in France today, but they supposedly were involved in other plastics molding and manufacturing, so may now exist as a different company, or as part of a larger conglomerate. 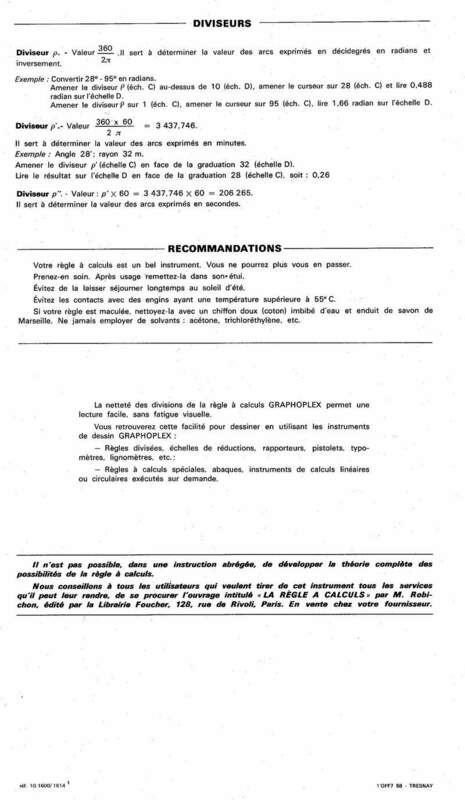 Graphoplex clearly exported rules outside of France, as the instructions supplied with rules come with French, Spanish, German and Italian inserts, and were rules were also redistributed to the USA via Koh-I-Noor. Despite this, they are quite uncommon outside of France today, and virtually all the examples here were obtained in France for me by fellow collector Stéphane Guglielmi [sguglielmi@free.fr] from local store finds. 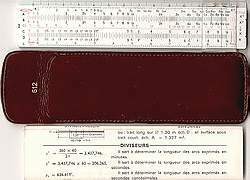 I was able to find two Koh-I-Noor sets here, but only one other original Graphoplex rule. 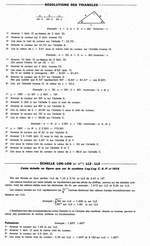 So far, we have located a wide variety of simplex pocket and full sized rules, and several full sized duplex rules, all in plastic construction. Circular rules existed under the tradename Roplex, with an uncommon wheel-rotation design. 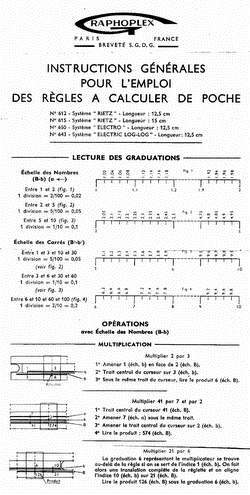 Pocket duplex rules were quite uncommon, with only a single example found so far, the 692b. 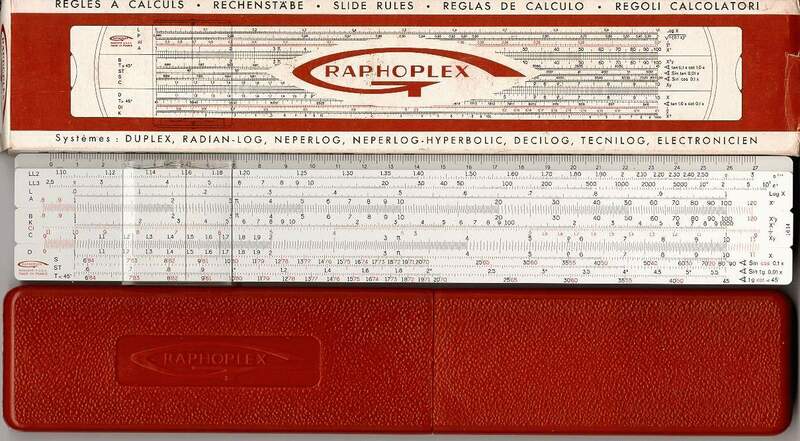 Many later Graphoplex rules have a very unusual color scheme, with violet, red and gray markings, with gray end braces, and maroon cases. They are visually very striking, something often hard to judge well from a scan, which tends to increase the visual contrast (gray becomes black), and makes exact colors hard to reproduce. The 621 has crisp black scales, with inverse and extension areas in red, and many extra secondary numbers in pale blue, an exceptionally clean and clear rule layout, worth tracking down. 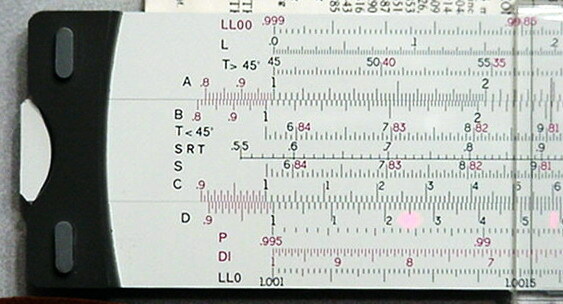 The surface finish is very glossy on most rules, and the scale markings appear to be underneath a thin clear surface coating or layer. 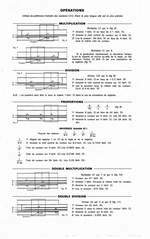 Thanks also to John Mosand, Marc Thomas and Bill Robinson for additional model information and corrections. The ARCHIVE will appear below shortly! ARCHIVE: JUST SCROLL DOWN TO SEE EVERYTHING ! 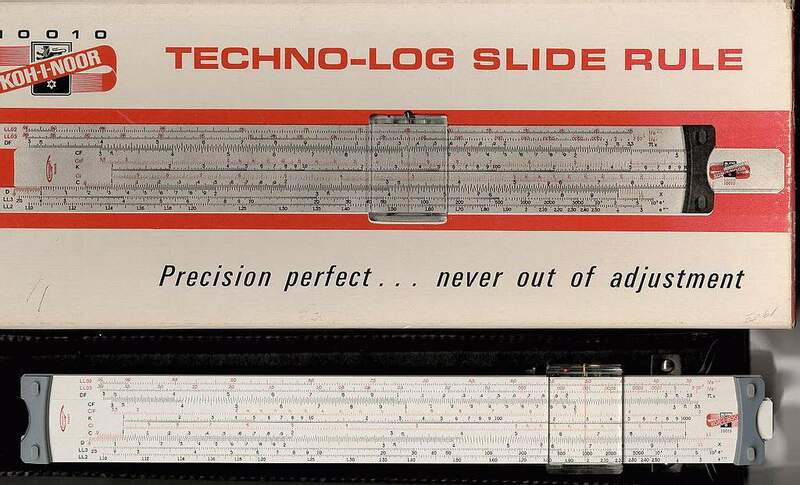 Instructions were typically very short, folded brochures, often folded to fit inside the cases. 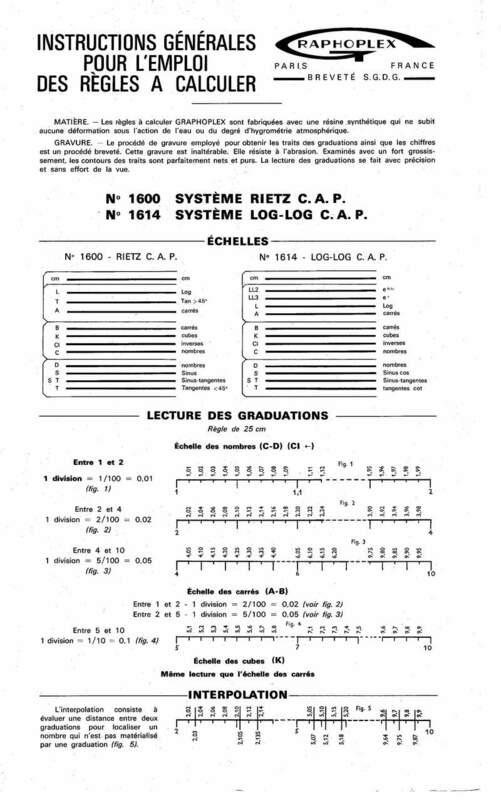 A short form catalog often was present at the top, listing similar rules by model number. 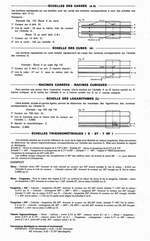 Extended capacity log log rule, has (P) Pythagorean scale. 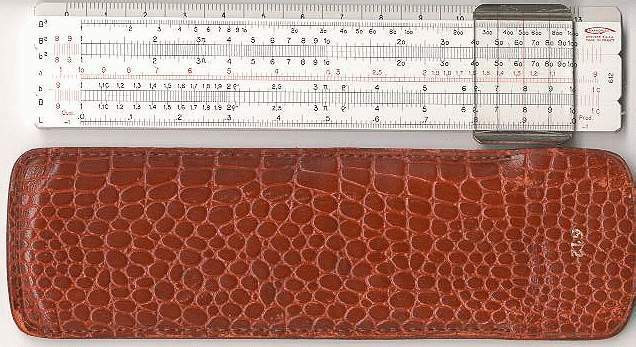 Leather Flap case. 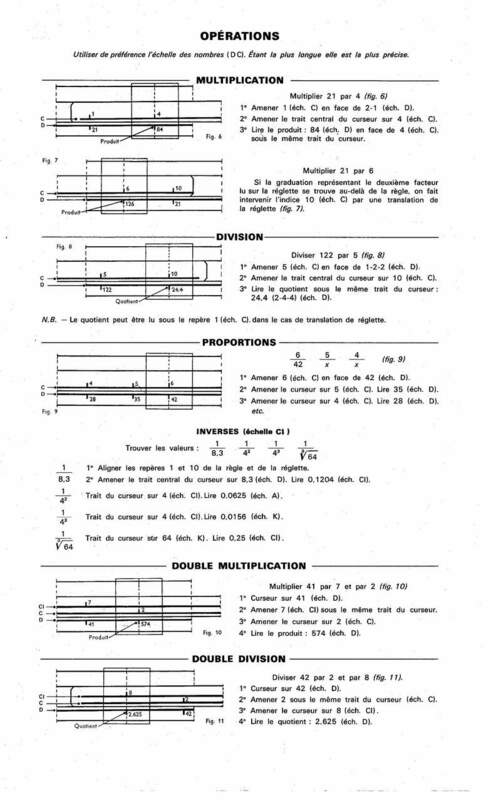 Original French manual for this series, courtesy of Daniel Fournier, CLICK HERE to download PDF (3Mb). 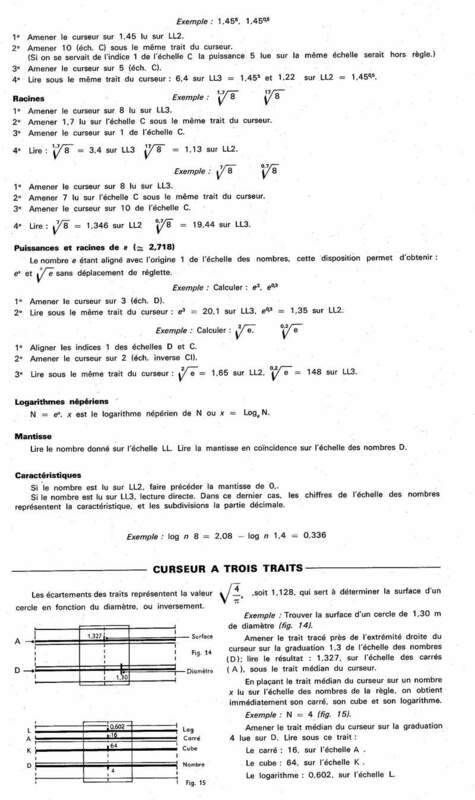 CLICK on each image to see the page in full size! 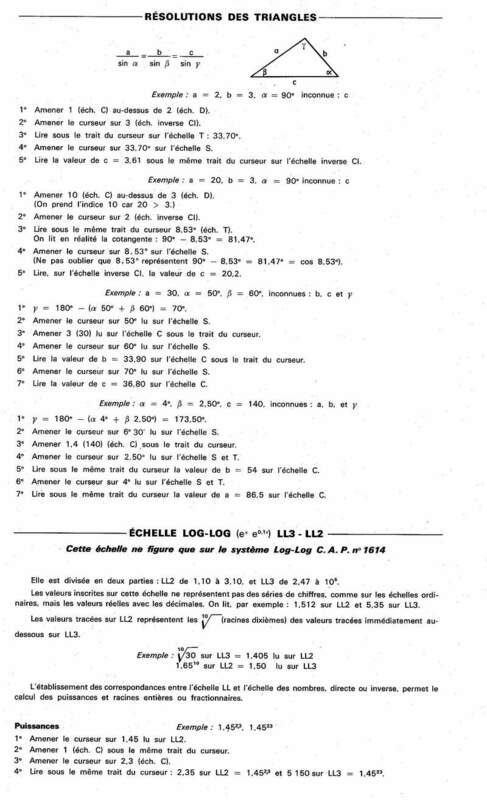 here is the full manual packed with these rules (in French), including some application data. 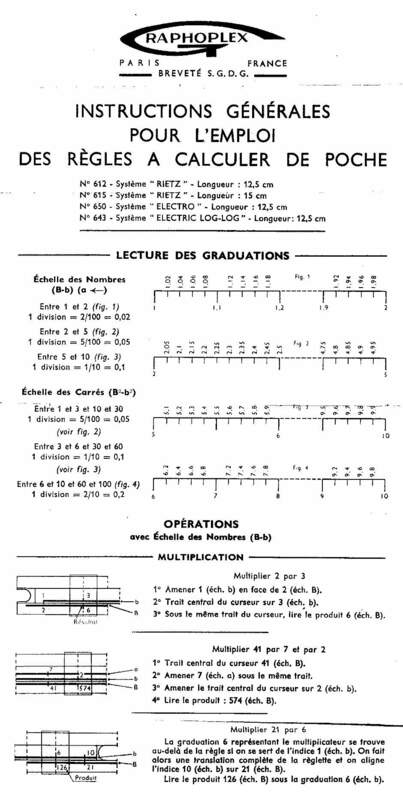 This is typical of the instructions supplied with most of the more complex rules. 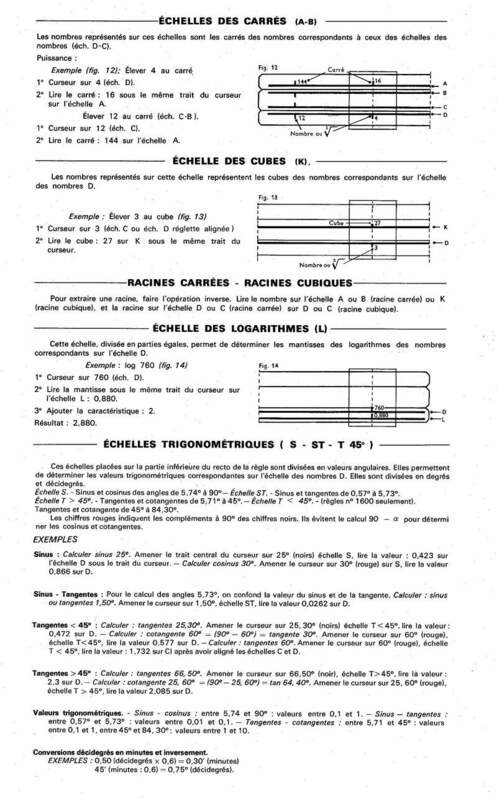 Ther is also a formula chart (strip form) included with some rules. Missing Images Do you have one of the rules we have no data or pictures for? Please EMAIL it to us so we can include it. Many thanks, Walter Shawlee 2. & the ad hoc Godzilla Graphics Group.